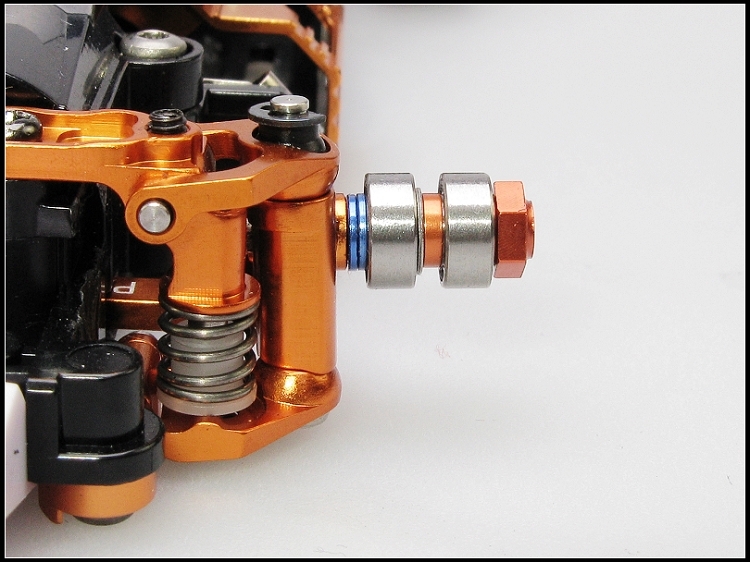 PN RACING: New Mini-Z Precision Gear Differential (Adjustable). Ko-Propo va présenter sa nouvelle radio au salon “Toy fair” de Nuremberg. En avant première nous présentons les caractéristiques de cette radio futurisme et conceptuelle. Cette radio se divise en 3 unités distinctes: l’unité des gaz (le manche), l’unité principale et l’unité de direction. A noter que l’unité de direction nous dévoile un nouveau concept: un stick ! Cette radio s’alimente avec 4 piles de type AAA. Pour sa sortie, la radio est présentée avec l’unité principale 2.4GHZ FHSS. Nous ne savons pas si une unité principale sera spécifiquement commercialisée pour l’usage de la mini-z mais comme la radio se dit être un concept d’unités optionnelles, il a beaucoup de chance d’esperer une prochaine commercialisation. Cela faisait un petit moment que nous attendions des nouveautées de PN Racing. C’est le cas avec ce nouveau POD qui innove avec le diff monté sur un bloc reglable au mm. cela permet d’augmenter ou de réduire l’empattement très rapidement. Et non, vous ne rêvez pas. Atomic ne va pas totalement transformer votre MR03 en MR02 mais pour répondre à certains clients qui préfèreraient une installation plus simple avec un gain minime carrossage et de rigidité, voici donc une autre option face-avant pour la MR-03. Nous avons vu la naissance du mini-z buggy en 2011 et nous nous réjouirons de l’émergence de la mini-z moto en 2012. Espérons que 2012 continue de nous enrichir de nouveautées dans ce loisir que nous partagons et que nous aimons…. donc je vous souhaite “amis Zédeurs” ainsi que toute la team TRP Une excellente année 2012 !! The very popular Moto GP machine has been truly shrunk down to a 1:18 scale model that will fit in the palm of your hand. The YAMAHA YZR-M1 is now under your control, ready to battle with your friends on Mini-Z size race tracks. Looking at the constant demands for the 1/8 scale Hanging On Racer, there are for sure not a few enthusiasts of R/C motorcycles all over the world. However, it is true that it was not easy for R/C beginners to get used to driving an R/C motorcycle because a two-wheel vehicle is naturally unstable at the low speed range. The MINI-Z Moto Racer has adopted sophisticated technologies to overcome this problem and has lowered the hurdle while maintaining the fun of control. Anybody can now jump into this genre and feel the fun of two-wheel vehicle driving. The first hobby grade R/C Micro Motorcycle at this size! The innovative E-gyro system equipped within the rear wheel keeps the bike going straight even running at a super slow speed while realizing quick leaning action at a high speed. With the digital proportional system for steering and throttle, you can control the bike as if you are riding on it! No special technique is required to drive it, if you are an experienced R/C car driver, you’ll only need a short period of practice to get used to it. Even if the bike falls down, no worries, the support bars hold the bike at a certain angle and help restart running when some throttle is applied. Equipped with a high power coreless drive motor, lightweight 3.7V 120mAh LiPo battery, and ten ball bearings the bike accelerates up to 20km/h without stress and realizes up to 10-minute runtime. Thanks to the E-gyro system, the Mini-Z Moto Racer can run virtually on any on-road surfaces such as needle punched carpets, urethane tracks, tiles, and smoothly paved asphalt. E-Gyro – A flywheel spinning in the rear wheel driven by a dedicated brushless motor an E-gyro greatly increases the stability of the bike especially at slow speeds. The spinning RPM of the E-gyro can be configured from the transmitter independently from high and low throttle input. The E-gyro effect (RPM) can be controlled by turning a knob on the transmitter you can adjust for the best balance between stability and agility while you are driving the bike. FHSS 2.4GHz – The new KT-19 transmitter uses the Frequency Hopping Spectrum System, which is considered to be more resistant to interference or lockout when the 2.4GHz frequency ban is congested. The gyro RPM can be controlled inversely proportional to the throttle input, so the E-gyro can spin faster when throttle is off and slower when throttle is wide open. 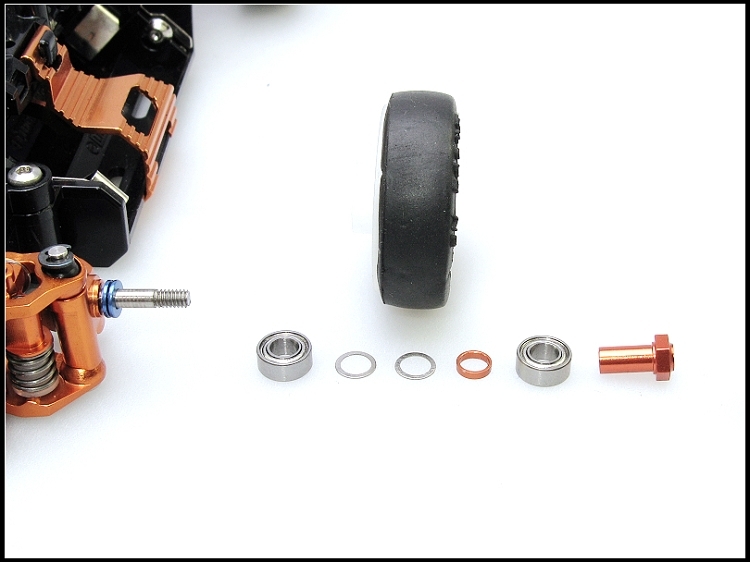 Caster Angle – You can fine tune the caster angle and adjust the cornering characteristics of the motorcycle to match your driving style. F/R Suspension – Coil springs are integrated in the front fork and rear swing arm suspension system providing great road handling performance. LiPo Charger – Included is a USB LiPo battery charger. The charger charges a liPo battery in 20 to 60 minutes. It can either be powered by the KT-19 transmitter or any USB power supply currently available in the market. The KT-19 transmitter can charge LiPo batteries 3 to 5 times with a set of alkaline batteries and the charger indicates the remaining capacity of the transmitter batteries. When using a powerful USB power source, the charger can charge two LiPo batteries simultaneously. Smooth – The Mini Z Moto is equipped with a full ball bearing drive train, giving you the best and most efficient drive train possible. More Friends – There are advantages to using the latest 2.4GHz technology like not having to worry about frequencies, radio hits and not being able to race with your friends. The FHSS system allows you to run up to 40 bikes can be operated simultaneously. Yamaha YZR-M1 body and rider are pre painted. Top Speed: approx 12 mph. A venir ce mois-ci, 3 nouvelles autoscales R246. Nous n’avions plus beaucoup de nouveautées depuis plusieurs mois, R246 semblerait reprendre du service. Nous esperons surtout la sortie de la Toyota pour les prochains mois, croisons les doigts! Concluons ces nouveautées avec plus de détails sur la sortie de la nouvelle Formule1 et sa platine en 2.4ghz. A bientôt. A NEW BODY and NEW RC UNIT deliver the ultra-realistic formula racing experience. The 2.4GHz one-piece RA-23T receiver-amp control unit requires no frequency band crystals and features Chase Mode (Tiki Tiki Mode) that turns up the heat of racing excitement. When used with a compatible 3-channel transmitter (sold separately), the Chase Mode acts as a power limiter to restrict output to 70% of full throttle. However, when the opportunity presents itself, push the 3rd channel button and output is instantaneously increased to 100% for a 3-second burst of speed. Inspired by the boost button on full-size formula racing machines, this new feature dramatically increases the intensity of racing action! Restricting the maximum speed actually allows better driving lines and supports easier control, but once the overtake button is pushed, the machine surges forward! The lead can change numerous times during a race with much more overtaking for thrilling racing battles. Also, the Chase Mode can be set so the overtake button can only be used a certain number of times per machine (optional No.82080/I.C.S. USB adapter and computer are required). This allows you to apply a handicapping system by restricting the number of speed bursts each car can use so beginners can compete on a more even footing with more experienced drivers. 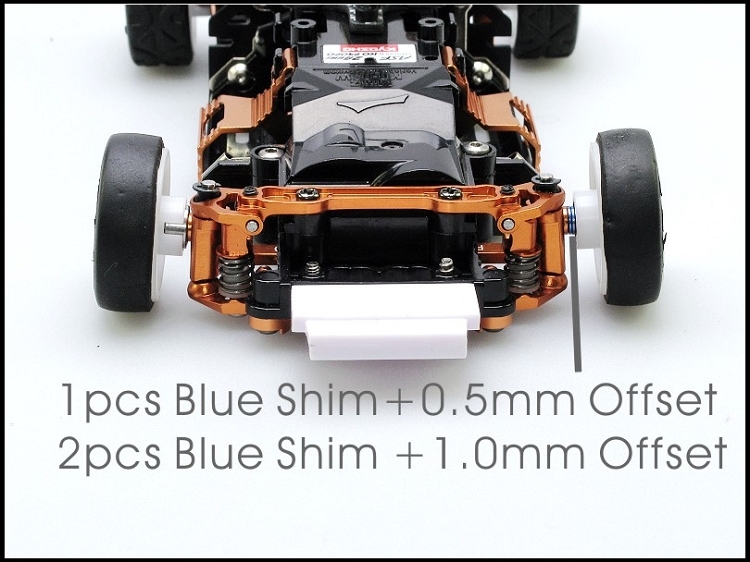 Of course, the ASF 2.4GHz 2-channel transmitter for the MINI-Z Racer can be used and an optional gyro can also be installed. The gyro functions by evaluating the running posture of the model and automatically correcting the steering and throttle for smoother control making it easier to drive, especially for beginners. 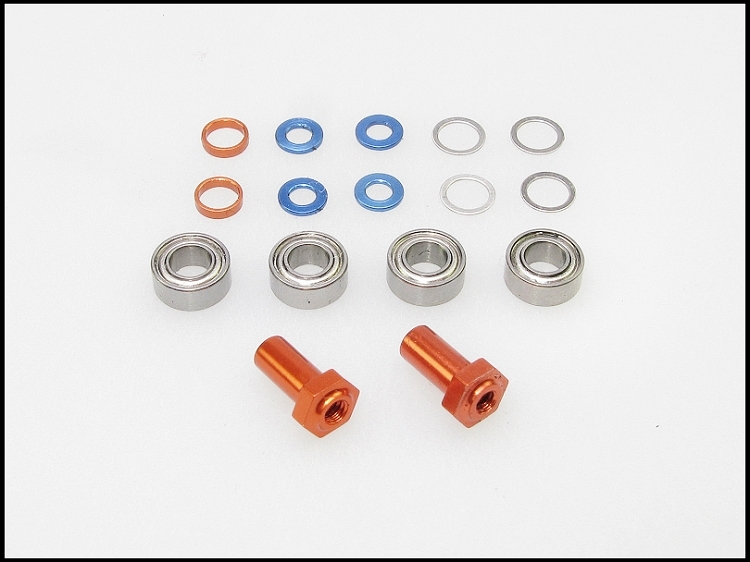 As this set is packaged without transmitter, it is ideal for existing owners of an ASF 2.4GHz MINI-Z Racer, making it economical as a 2nd or even 3rd model. With the power of technology in your hands, the advanced performance of this machine with Chase Mode promises the ultimate R/C formula racing experience. McLaren Body – The body form captures the latest formula design and features. This highly detailed finis is consistent with regulations governing the full size racing machines. RA-24T – The 2.4Ghz RA-24T features Chase Mode to turbo boost your racing experience and requires no frequency crystal. Rear Sus. – The rear suspension features separate coil plus twin arm swing system, that provides superior surface maneuverability. King Pin – Features a king pin and coil suspension system up front, that delivers precise control. Heat Dissipation – An opening under the motor mount provides an efficient heat dissipation system. Bevel – Bevel type gears produce a more stable cornering feel. ASF 2.4GHz – Equipped with the next generation 2.4GHz RC unit especially designed for the Mini Z F1. Which requires no frequency crystals, simply switch on the power and enjoy. The ASF 2.4GHz System Automatically scans for an open frequency and promises safer and more secure control. Standard Set Up – All kits are shipped with the standard setup and chase mode can be activated with a push of a single button. Other settings changes can be made by using I.C.S. USB adapter (sold separately). Chase mode functions to limit power output to 70% of full throttle. When the moment comes to attack, a push of the 3rd channel button on the transmitter increases power output to 100% for 3-second burst of speed. This enables greater driving control and also adds the excitement of overtaking duels so drivers can enjoy nose to tail racing battles. Also, the number of power boosts can be set to apply a handicapping system to level the playing field for drivers of different experience levels. At the time of shipment, the overtake function is set to a maximum of 5 times per race. What is ARR Chassis Set? An ARR Chassis Set is a semi-assembled chassis model that includes nearly everything you need to run. A Pre-painted body is included, so only consumables like batteries and a KT-18 transmitter #82001 are required so you can start operating the model without delay. Completed body, finished with painting and affixed with decals. 3 Channel transmitter for Mini Z compatible with ASF 2.4GHz (Recommended: Kyosho EX-5UR ASF Transmitter No. 82012) or compatible ASF 3 Channel KO Propo Transmitter. A Standard KT-18 Transmitter will work if not using Chase Mode No. 82001. I.C.S USB adapter (No.82080) for suing ICS functions and Chase mode adjustments. ** NOTE: Chase function may work with R246 2.4GHz module adapter but it’s not guaranteed with transmitters other than Kyosho or KO Propo 3 Channel transmitters. Also the 2 Channel Kyosho KT-18 transmitter can be used without using chase mode.